Trailermade Films | Short Form. Big Ideas. Trailermade Films | Short Form. Big Ideas. Trailermade Films is a leading boutique media agency specialising in web series, book trailers, commercials, music videos and other kinds of creative content. Launched in 2012 by BAFTA-nominated filmmaker, Jack Jewers, Trailermade helped revolutionise the field of book trailers, by bringing ad agency-quality results to clients at all levels. We're innovative and we know how to manage a budget--big or small. We've worked with everyone from the world's leading publishers, to self-published authors trying to make a name for themselves. And no matter who you are, we really want to make you an amazing book trailer. 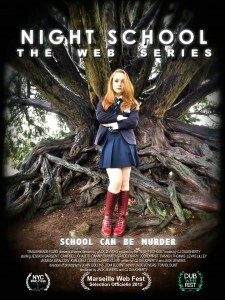 In 2014 we released our first web series, Night School, based on the international bestselling books by CJ Daugherty (we've made her book trailers for years). The series, the first ever to be based on a young adult novel outside the US, was a huge success. It gained press coverage around the world, including a cover story in the Guardian, and was twice voted best web series in the world by the Los Angeles-based Indie Series Network. Night School has since been shown in competition at film festivals around the world, including New York, Dublin, and the prestigious Marseille Web Fest. We are currently in pre-production on a slate of new web series, to be released in 2016. We have made music videos for artists as diverse as Debbie Wiseman MBE, one of the UK's top film and classical composers; and up-and-coming young singer-songwriter Betsa Collins. We've also made TV ads; film trailers; web ads; short films; and a whole assortment of 'easter eggs' and other beautiful things for creative people. So that's us. Short form; big ideas. How about you? These are just a few of the clients we've worked with recently. And to see more of our latest work in action, simply click on the banner below to be taken directly to our YouTube Channel.